Looking at key processes to ensure consistent saturation of plugs and blocks to ensure crop is off to a good start. Mastronardi Produce President and CEO Paul Mastronardi has been named Ontario’s 2013 Ernst & Young Entrepreneur Of The Year in the Food & Beverage category. 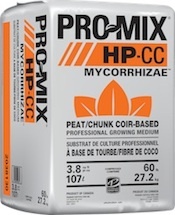 PRO-MIX® HP Chunk Coir Mycorrhizae™ is a light weight, high porosity peat-based growing medium that contains chunk coir. This growing medium ensures optimum growth, especially when high air capacity and extra drainage are required. It is ideal for water sensitive crops, rooting cuttings and/or low-light growing conditions. Leading garden centres and nursery growers in Ontario’s were honoured earlier today with Awards of Excellence at Garden and Floral Expo 2013. Preparing for festive season sales? Berger, a leading producer of growing mixes, has acquired Beaver Peat Moss and Lafaille Peat Moss, consolidating a long-standing relationship between the companies.